Presented the rare crystalline individuals of hexagonal oblate form. The dissipated branchy formations and small dense the masses are more ordinary. Colors copper-red, with the reflection of violet tone. Breithauptite be found in an association with native silver, by the minerals of silver and with silver-arsenic minerals. Wonderful standards as prismatic crystals and massive small accumulations of copper-coloured color are found in the mineries of Sar-rabus in Sardinia (Monte-nar-ba, Masaloni, Dzhiovanni Bond). Breithauptite be found jointly with sphalerite, ullmannite, Millerite ohm, galena, galenite. 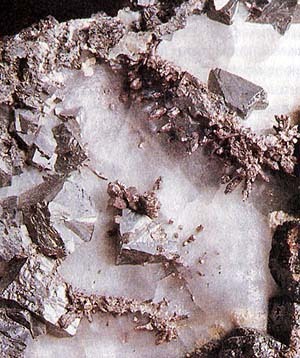 The less beautiful, but more numerous standards of breithauptite are obtained in Andreasberge in Garce (Germany, EU) and Cobalt, Ontario (Canada, America). Breithauptite has insignificant practical use.